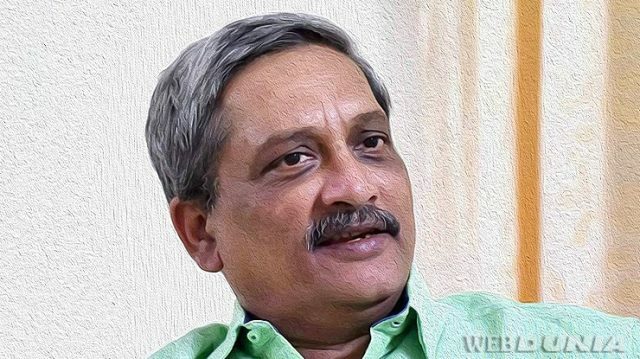 New Delhi/Panaji: Goa Chief Minister and former Defence Minister Manohor Parrikar breathed his last at his private residence near Panaji on Sunday. He was 63.He was suffering from a pancreatic ailment.The announcement of his death was made around 1845 hours. Last rites will be held on Monday. President Ram Nath Kovind described the Late Chief Minister "epitome of integrity and dedication" in public life and truly his service to the people of Goa and of India "will not be forgotten". "India will be eternally grateful to Shri Manohar Parrikar for his tenure as our Defence Minister," Prime Minister said and called him an 'unparalleled leader'.Two Union Ministers Rajnath Singh and Nitin Gadkari are likely to be in Goa on Monday. Ailing for last several weeks, an IIT engineer-turned-politician Parrikar's health deteriorated for worse in the past few days.A widower, Parrikar is survived by his two sons and their families. The central government announced national mourning on Monday. Prime Minister Modi is likely to preside the Union Cabinet meet to condole his death on Monday morning. "Centre announces national mourning tomorrow (Monday) following the demise of CM of Goa, Shri Manohar Parrikar. National Flag will fly at half-mast in the National Capital & capitals of States and UTs. State funeral to be accorded to Shri Parrikar," an official spokesman said. Late Parrikar would be also remembered as a BJP leader from Goa - who was not only a trusted aide and Man Friday for the Prime Minister Narendra Modi, 'Parrikar' was the Goa BJP legislators 'only choice' in 2017 when the party decided to form a new government after a fiercely fought assembly elections had thrown up a hung assembly. "I will miss my Goan fish," Mr Parrikar had said when he moved to Delhi to join the Modi cabinet.His detractors often mocked the manner he walked 'as a Defence Minister' betraying his middle class. mannerism, but he generally sought to look the other way and focused on work. The much talked about One Rank One Pension for the armed forces came up during his time and was cleared by the government as well. The Goa government on Sunday expressed profound sorrow on the sad demise of Chief Minister Manohar Parrikar in the state. As a mark of respect to the departed dignitary, seven days state mourning will be observed throughout the state of Goa from March 18 to March 24 - both days inclusive, an announcement said. BJP president Amit Shah tweeted, "Manohar Parrikar ji's demise is extremely painful. In him, the nation has lost a true patriot who selflessly dedicated his entire life to the country and ideology. Parrikar jis commitment towards his people and duties was exemplary." Late Parrikar entered electoral politics in 1994 when he won on a BJP ticket from Panaji constituency.He was the Defence Minister from November 2014 to March 2017. From BJP's perspective, he is credited for first proposing the name of Narendra Modi as the party's Prime Ministerial candidate in June 2013 when the likes of L K Advani were opposed to the idea.Late Parrikar's joining the active politics in 1994 also stalled the growth of regional outfit Maharashtrawadi Gomantak Party (MGP) in Goa. His stint in the centre as the Defence Minister saw Indian forces undertaking the unique surgical strike in September 2017 after the Uri attack and also implementation of the One Rank One Pension scheme for armed forces personnel. In political perspective, however, his death has set the ball rolling to look for a replacement in the BJP-led coalition. The 63-year-old Parrikar, who had died of a pancreatic ailment on Sunday, was heading a coalition government comprising the BJP, Goa Forward Party and MGP. Central BJP leaders are already in touch with the leaders of the coalition parties. Late Parrikar represented the Panaji assembly seat. For its part, the Election Commission has already announced by-elections at Shiroda, Mandrem and Mapusa assembly constituencies on April 23.These will held in the state along with the Lok Sabha polls. The BJP in Goa announced that the mortal remains of the Chief Minster would be kept at the party head office in Panaji from 0930 hrs to 1030 hrs. Thereafter, the mortal remains will be taken to Kala Academy, where people will be able to pay tribute to the departed leader from 1100 hrs to 1600 hrs.